As a result of a CQC review at St George's, it was decided that the renal unit must move from its current buildings in the Knightsbridge Wing due to concerns over electrical problems and other long standing issues. This update is to present the latest information about the move, let you know how the KPA views the changes and what it is doing to contribute to improvements in the service, and to advise patients of the uncertainties ahead. It was the committee’s opinion that, although it is extremely disappointed that we find the Renal Unit in this situation, given these difficult choices, the Trust and staff made the right choice. It will mean that the unit is able to continue to deliver an excellent service and nationally leading outcomes for patients. The Buckland Ward will be moved from its current location to the Champneys Ward on the 4th floor of Lanesborough Wing. The move will result in a reduction of one bed. The move is planned for the beginning of December, if water tests are successful, according to the current plans. Most Chronic Dialysis patients will move from the Tooting campus to satellite dialysis centres. Those on Norman Tanner Ward have already moved. Knightsbridge ward patients moves should be completed in November. There will be 7 Chronic Dialysis stations in the mobile dialysis unit. 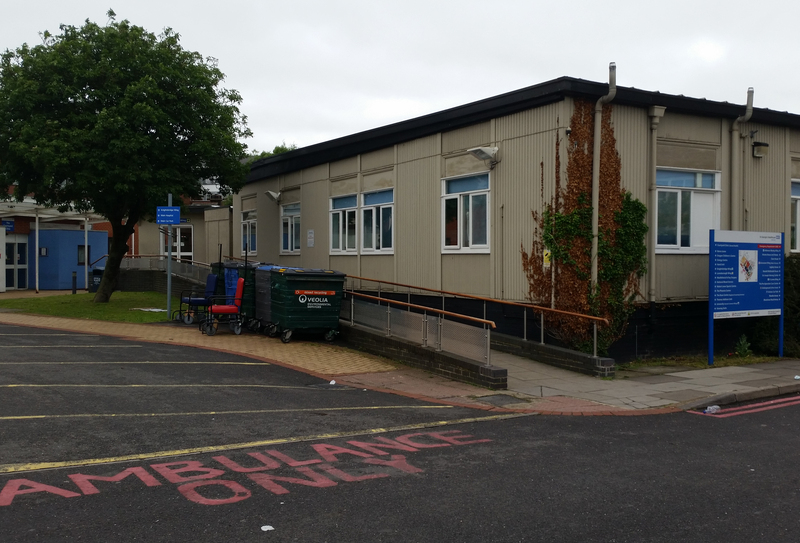 As the access to this unit is limited it is not currently considered suitable for most patients with mobility or other medical complications. More details will become available when the unit is commissioned in the coming weeks (mid-November 2016). 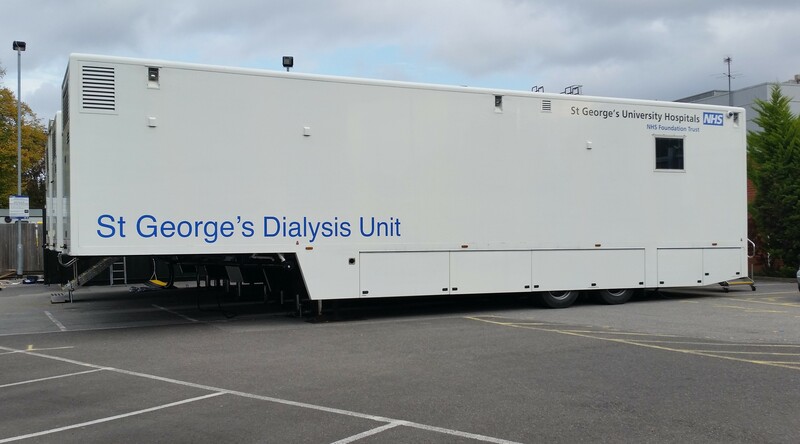 A second trailer system (trilogy) is planned and this doubles the Haemodialysis capacity (an extra 7 stations) which should allow 42 patients who have moved offsite to return to St George's. This will move from Buckland to Champneys where it is planned to run 4 inpatient Haemodialysis slots, this area will operate over three shifts per day instead of the two previously. Therefore 12 inpatients per day can receive care. The ward has been plumbed with 8 points to give flexibility and allow some bedside dialysis. (Home Haemodialysis (HD) and Peritoneal Dialysis(PD)) will move to Colliers Wood. An acute PD Nurse will support Champneys Ward to perform Peritoneal Dialysis as is the case on Buckland Ward today. As of time of writing, there has been no decision taken on where transplantation services will be moved to. We have visited a proposed location (on the 4th November) and, if agreed, it would make an excellent location. (We hope to have a decision next week). So unless and until you are notified otherwise, the clinics will continue in their current location, adjacent to Buckland Ward. Differences in the processes between NHS and Fresenius staff. Communications with patients could, and should, have been better. Lack of familiarity with some patients more complex or specific needs. Work is underway to address each these issues and NHS staff are undertaking shifts covering dialysis times at each of the satellite sites, as far as is practical. In most cases, any on going issues should be raised with your nominated dialysis nurse, or the location manager. 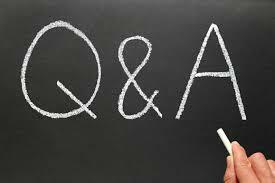 Unresolved issues should be escalated to either Fiona Sinclair (Haemodialysis specialist practioner) or Marlene Johnson (Matron). Resolve the the transition issues. Conclude the discussions on the expansion of the number of beds at Colliers Wood. Provide more choice of dialysis times and a transparent process for allowing patients to change dialysis times when possible. Identify and provide more dialysis beds at St Georges, subject to space and management funding. Agree a long term plan, resolving the current uncertainties about the provision of renal services at St George's. It is the intention of both the St George's Kidney Patients Association and the Renal team to continue to press for a new location to consolidate all renal services within the campus into one building. What has become evidently clear is that there will be no progress on this issue, unless and until there is central government funding for such a development. The current funding crisis in the NHS continues to dominate all aspects of care provision and the deficit at St George's may increase from around £55m in 2015-16 to as much as £120m in 2016-17. What were the circumstances that led to the enforced changes? The CQC review team took evidence from staff and patients. During that process, the team’s attention was drawn to a leak after a significant rainstorm. The leak was near an electrical outlet, and the electrical systems are older, no longer meeting modern standards. Is the Knightsbridge Wing including Buckland Ward, still safe? A significant amount of remedial work has been undertaken over the last few weeks to rectify roofing problems and get new electrical certifications. This is considered sufficient by the CQC for the short term (for 12 weeks until the move is made). Until this work is completed, some Renal Unit areas of the Knightsbridge Wing, will be out of use to patients. Why can’t I have the same time slot for dialysis that I have now? There will an expansion of slots available at satellite dialysis sites. Unfortunately the majority of those slots will be at new shifts on the evenings of Tuesday, Thursday and Saturday. Hence many patients will be offered these evening slots. We know that the staff have been asking existing patients at satellite sites if they are interested in evening dialysis, but so far few, if any have come forward to change times. What can I do if I am not prepared to move slots? Ultimately if you are not willing to accept the offered slots you can approach other hospital trusts in the area to see if they have any suitable times and sites. Alternatively you can register your preference with staff and hope that a natural cycle of patients will free a more suitable time. However there are no guarantees either way. What is happening to NHS dialysis staff at the Tooting site and facilities at the satellite sites (Colliers Wood & North Wandsworth)? The plan is for services provided at satellite sites will be expanded. This would include NHS staff being based at these sites providing blood transfusions, medication and potentially minor procedures. What do you mean by “nationally leading outcomes"? The St George’s Renal Unit currently has amongst the best survival rates for transplant and dialysis patients in the country. We hope to publish an article soon outlining more detail. Will there be any dialysis at the St George’s Tooting site? There will be 6 Acute dialysis stations (for inpatients with immediate dialysis needs) in the new ward in Lanesborough Wing. There will be 7 Chronic Dialysis stations in the mobile dialysis unit. As the access to this unit is limited it is not considered suitable for most patients with mobility or other medical complications (see http://www.ems-healthcare.com/medical-trailers/liberty-quad/ for details). A further expansion of a trilogy trailer system to add 7 dialysis stations is dependent on agreement and funding by the hospital Trust which is not currently in place. The implementation of this is dependent on a number of local factors still being worked on. What is happening to Peritoneal Dialysis (PD)? The current plan is to move the service to Colliers Wood while recruiting an additional PD nurse to allow one nurse to remain to support the needs on Champneys Ward. Why can’t the current building be repaired to allow its continued use? The repairs necessary to reach a standard acceptable to the CQC would take too much time (an unacceptable risk to the CQC), be extremely disruptive to patients (possibly more disruptive than the planned move) and ultimately a very costly investment in a building that we have been arguing for years is not fit for purpose. The Knightsbridge Wing was built 120 years ago. What will happen to the current buildings? The intention is the buildings will be demolished as soon as funding is approved for redevelopment on the St George’s Tooting site. The staff accommodation building may remain in use longer than patient areas in the short term. Why can’t we wait for a new building to be built as planned? The currently proposed modular building (see www.sgkpa.org.uk for details) would take too much time to build and move in to (an unacceptable risk to the CQC). It is also still awaiting approval for funding approval from NHS Improvement (formerly NHS Monitor) that is the national body that holds budgets for exceptional funding requirements. As of October 2016, no approval for funding had been received. What is happening to the plans to build a new unit? It is still the Trust’s Board’s intention to create a new renal facility. What has become clear however is that due to the poor state of the hospital’s financial situation, any new development on the site is reliant on an application for national funds. Until funding is approved any intentions remain just that, intentions. What involvement did the St George's Kidney Patients Association have with the decision to relocate renal services from the Knightsbridge Wing? What has the committee been doing since the decision to improve the situation for patients? As patients ourselves we understand the impact on patients and in particular, dialysis patients. We have been pressing to minimise the number of patients who have to change the time of day that they dialyse. We are also arguing for improvements in transport options, particularly for evening slot patients. CQC – The Care Quality Commission makes sure health and social care services provide people with safe, effective, compassionate, high-quality care and encourage care services to improve. They monitor, inspect and regulate services to make sure they meet fundamental standards of quality and safety and they publish what they find, including performance ratings to help people choose care.